The recently concluded Russian international animation films festival, KROK, the largest ever, saw participation from animators of 24 countries, including France, Germany, India, the U.S., China and Spain. A selection of five of the most interesting films, for adults and children, from the festival follows. Director Konstantin Bronzit's animation movie ‘We cannot live without space’ won the “Tour de Force” award at KROK. Bronzit's Oscar-nominated film has become part of the "space" trend in world cinema. The director, who gravitated earlier toward films of ironic humour (At the Ends of the Earth, Lavatory Love story, Alyosha Popovich and Tugarin the Snake), put together a dramatic new picture which combines lightness with depth, while the idea of "space" has a broad emotional range; from love to grief. The film has been better received abroad than in Russia. During the summer of 2015 Bronzit won top honours at the Annecy International Animated Film Festival, one of the oldest such festivals in the world. KROK's main prize was awarded to Svetlana Filippova for her charcoal film Brut, a moving story about the killing of Jews during the Second World War, narrated by a German shepherd called ‘Brut’. Dogs have always been part of the director's films, starting with her debut The Night Has Come. The film she shot before Brut is called Where Dogs Die. Of all her teachers, Filippova owes most to the traditions of the great Yuri Norstein. Her dogs are somehow reminiscent of the wolf from Norstein's Tale of Tales which, in 1984, was named "the best animated film of all time and all nations," by the Academy of Motion Picture Arts and Sciences in Los Angeles. Tomek Ducki was born in Hungary, where he learnedanimation before continuing his studies in the UK. For the last several years he has lived in Poland, which has had an excellent animation school since the socialist era. There he created Baths. Executed in a mixture of techniques, the film is a reflection on life. Immersing his characters in water, Ducki gives the audience an opportunity to see a different reality. The director searches for that evasive border between the past and the present, between fantasy and reality, simultaneously studying the relation between the body and consciousness as they are placed in an unusual environment. Baths has already received the main prize at festivals in the U.S., Switzerland and Portugal. In Russia it was named the best film in the “Under Five Minutes” category. Just like Tomek Ducki, Andreas Hykade from Germany is also fascinated by life's processes. His Nuggets is an excellent example of minimalism, proving that great force lies in simplicity. Hykade says that during his work he always thinks of his children. That is why Nuggets will win over viewers of all ages: Kids will see an amusing bird and the transformation of its flights, while adults will see a story of the full life cycle, in which desire soon stops corresponding to opportunities. Compte les moutons / Counting Sheep - teaser from Les Films du Nord. Source: Vimeo. Although Frits Standaert's Franco-Belgian project was named Best Children's Film at KROK, parents would benefit much more from the film than children. 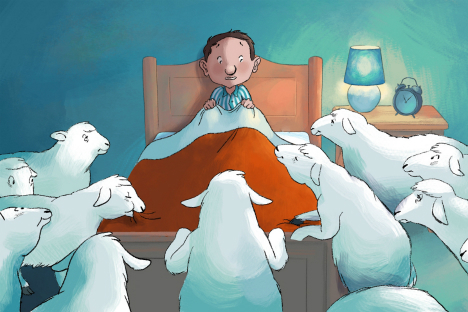 The film tells the story of a boy who starts counting sheep before going to sleep and suddenly sees a dozen of the cloven-hooved animals by his bed. According to the director, thistale of the power of the imagination and the parallel reality in which the child lives is possibleonly in a situation in which his mother is always at work and his househusband father is more interested in newspaper articles than in his son. Standaert, whose most famous work is a comedy pantomime about animals called Rumors, opened a new page in his artistic biography with Counting Sheep by turning to poetry and delicateness. For viewers this picture is another reminder that Francophone animation is among the very best.